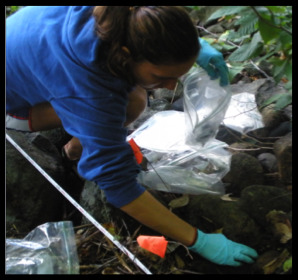 My previous research experiences span a wide range of field sites and lab techniques, but are linked by a common theme of anthropogenic disturbance. You can read about all my past projects and see links to reports and poster below. My senior thesis project, investigating hydrologic controls of mercury (Hg) deposition onto a floodplain, highlights my research experience specific to fluvial systems. My project aimed to identify the hydrologic and geomorphic processes that control sediment exchange between channel and floodplain, to better understand how and when contaminants enter a stream channel. I collected and analyzed sediment samples for total-Hg concentration along a point-source contaminated stream (Androscoggin River, Berlin, NH), and compared these results to data collected from a control stream (Mink Brook, Hanover, NH). I also tested samples for fallout-radionuclides 7Be and 210Pbex, to provide temporal information. I found that recurrence interval was a significant predictor of floodplain contaminant distribution floodplain. Contaminant concentrations were high on the upper floodplain (recurrence interval >10yrs), where organic content (%LOI) was high, but decayed with increasing inundation frequency due to near-channel floodplain stripping. Channel slope in the longitudinal profile moderately influenced the magnitude of contaminant concentration at a site, with lower average concentrations found at high gradient sites. These results can directly guide remediation efforts and suggest the upper-floodplain stores large amounts of contaminated sediment, and that these contaminants are cut off from the channel during low to moderate flows. Although I conducted my undergraduate thesis independently, I worked closely with my advisor, several faculty, graduate students, and lab technicians to collect samples and analyze results, and also became proficient with instruments including a Direct Mercury Analyzer and High-energy Germanium Detectors. My senior thesis research was funded from several grants I applied for and received. My findings were presented as a poster at the AGU Fall 2012 meeting. Below, you can find links to my senior thesis and my AGU poster. I participated in a NSF REU investigating the eco-hydrology of a montane cloud forest, based at the Soltis Center in San Ramon, Costa Rica. 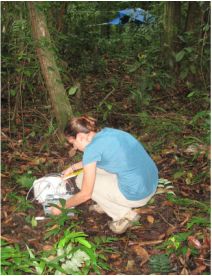 The motivation behind the project was to characterize fluxes of water in a selectively harvested tropical forest, and predict how these fluxes might shift under a changing climate. The research was a collaborative and inter-disciplinary effort involving 11 REU students and over 30 faculty. I worked with other student groups to collect and analyze soil temperature and moisture data from weather stations, and to collect atmospheric CO2 profiles with a tethered weather balloon. My individual project measured in-situ CO2 gas fluxes using static chambers and a LICOR H2O-CO2 Gas Analyzer. I compared in-situ measurements to values calculated from lab analyses with a gas chromatograph. Conducting research at an international field site presented unique challenges that taught me how to adapt to situations and still achieve results. For example, we planned to measure CO soil uptake rates, but the CO gas standards didn’t clear customs. Instead, we used car exhaust samples to roughly approximate uptake rates. We found that soil moisture, not soil temperature, was significantly correlated with CO2 flux rate and used this relationship to estimate total annual CO2 soil gas flux. The relationship we developed between soil moisture and gas flux could therefore be used to predict changes in terrestrial gas emissions resulting from shifts in climate. Our findings were presented as a poster at the AGU Fall 2011 meeting and in a final report. Below, you can find links to both. I worked with Dr. Meredith Kelly and then PhD student/now Dr. Laura Levy on an independent research project during my junior year of College. The project aimed to reconstruct glacial fluctuations during the Holocene using pro-glacial lake sediment cores collected in West Greenland to better understand cryosphere responses to climate change. I analyzed sediment cores for %TOC and %TIC using a muffle furnace, for grain-size using a laser particle size analyzer, and sampled for radiocarbon specimens. The basal ages from radiocarbon ages were about 9,000 calibrated years before present (cal yr bp). I interpreted the presence of organic matter to represent the onset of organic matter accumulation following the LGM. I interpreted laminated organic-rich muds to represent the Mid-Holocene warm period, which were capped by a finely laminated section representing the neoglacial period (about 2,800 cal yr bp). I also took the initiative to examine sediment samples under a microscope and made an exciting breakthrough: several cores contained chironomid skeletons! As a result of my discovery, a parallel project at Northwestern University was developed to use the organisms as paleothermometers for climate reconstruction. Similar to my senior thesis, I supported my own research with a research grant I applied for and received.4 Results were presented in a poster at the 2011 AGU Fall Meeting, for which I was a co-author.c This research also contributed to a larger multi-institutional project investigating climate fluctuation in using glacial lake cores, moraine mapping, and ice core analysis. Levy, Laura B., et al. "Holocene fluctuations of Bregne ice cap, Scoresby Sund, east Greenland: a proxy for climate along the Greenland Ice Sheet margin. "Quaternary Science Reviews 92 (2014): 357-368. Pdf of the paper is below. I worked under Dr. Brian Jackson in the trace elements lab at Dartmouth on the bioaccumulation and trophic transfer of environmental nanoparticles. Nanoparticles such as Cd, Zn, and Se enter the environment from improperly recycled electronics, where they become unstable and toxic to biota. This project, therefore, investigated how the small crustacean Daphnia filters and stores contaminated water and algae, and explored different techniques, such as field-flow-fractionation-ICP-MS, to detect trace-element levels of contamination. I worked as a microbiology lab technician under Dr. Dale Griffin at the USGS on a project funded by the EPA examining spatial patterns in the bacteria Bacillus anthracis (more commonly known as anthrax). The goal of the project was to understand which climates and soil condition promote growth of the bacteria, which has been documented in several livestock deaths. I collaborated with exchange students from Spain who were also working on the project, and will be a co-author on the manuscript of published results once the project is completed.